Hope we have all caught up. Need a big week two to get through to the halfway mark! Do it! Use those considerable powers. Good for you! I’ve been composting my themes and characters for what seems my entire adult life. I don’t know if I’m game to join you this year – I’m working on some picture book stories – but I will be cheering you on the sidelines. I think you can do it. Good luck!! Thank you. I think you are already doing what you need to do with your writing. But I will be glad of your support. Bring on the ra-ra pompoms. Sorry about the duplicate comments – something strange just happened with the comment box at my end! That’s great that you are re-writing! I think the word count goal will be addictive – and we will see what happens. I’m going to make November “rewrite my first draft month’. I’m even going away for 10 days to just write. This means abandoning the family, but I’ve got a job to! At least that’s what I’m telling them. Don’t worry too much about the story arc etc, just start writing & go with the flow. We should have a community of cheer leaders, supporting each other through the month. I’ll be cheering you on from the sidelines. Well, I hadn’t heard of this, but what a great idea. I’m going to make November ‘rewrite my novel month’. The first draft is done, but the rewrite is incredibly daunting! So daunting that I’m going away for 10 days to just write! This involves abandoning my family – but I tell myself I’m not selfish, I have a job to do. But, if you don’t do the 1,677 words every day, by setting the goal you’ll be amazed how much you do achieve. It stook me 18 months to write the first 30,000 words then 4 months to write the next 70,000. mostly because I set word count goals & was sick of myself not writing!. You are making me contemplate this. Which may be unwise. I do have ideas, lots of ideas, but it is the commitment to actually follow through on them. 1,167 words per day. Thinking. You have a lot to write about, a lot! You should at least have a go, even if you just write something. I know I would need it. I am hoping to do PiBoIdMo… Picture Book Idea Month! Picture Book ideas? So much harder. How to compress meaning into a few lines and some pictures – now that is a challenge! Good luck – report back on your progress? I actually find it easier – albeit I’m not published. 0/1 submissions so far – a long way to go still. also have jumped on the NaNo bandwagon too! And I will join you. 50 000 words. No problem. And when you get stuck, you can always start writing about what a terrible writer you are, how a blank page can be so nasty, its impact on your soul, and next thing you know a new dark character who reaches for whisky at 3am just to soothe a savage beast will turn up. Well that’s my experience. From last year. From last year when a gorgeous friend of mine encouraged me to join up. To type until the early hours, eyes stinging but fingers still moving. And while I would like to give her grief about throwing me in the deep end, I am nothing but grateful. And I know she already has the seeds of a great story. Time to just write! Ah Tallulah, there you are! Yes it is true I did bully you into it last year. And you finished. See you on the 3am shift somewhere near the end of November. I’m going to join you, sort of. But instead of writing 50,000 words of novel, I’m going to write 20,000 words of thesis. Mostly lit review. 667 words a day. I can do it. I’m hoping for inspiration, too. But before November comes, I have 15,000 words of method chapter to write. Gulp. 1000 words a day. 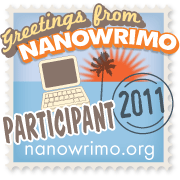 Looking forward to hearing about your NaNoWriMo journey! You can do it! You’ll be so glad when that part of your thesis is over. 1000 words a day – 2 x 500 word blocks – you can do that!